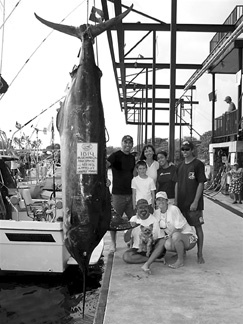 Captains Robert and Cyndee Hudson, a husband and wife team on the boat CAMELOT, put Tosh Ervin on the blue marlin of his dreams after they boated a 168-lb marlin, released a spearfish and a boated 10 small tuna for Tosh's kids. They struck the big blue in 43 fathoms of water as they were an ono run on the way home. They fought the fish for an hour before it dove deep and died. Nearly two more hours were required to plane it up from the depths. This was Capt. Robert Hudson's first grander in 29 years of fishing.